Online retail giant Amazon and the governments of eight South American countries have been given a final deadline to reach an agreement over how to use the ".amazon" web address extension after a seven-year dispute. What will happen next? It's a name that evokes epic proportions: the world's largest rainforest; a global tech company; and now a diplomatic saga nearing its end. This is the battle of the Amazon and it starts back in 2012. The Internet Corporation for Assigned Names and Numbers (ICANN), the body that polices the world wide web's address system, decided to expand its list of generic top-level domains (gTLD) - the bit that comes after the dot in a web address. The new rules allowed companies to apply for brand new extensions, offering internet users and businesses more ways to personalise their website name and addresses. But eight countries containing the Amazon rainforest objected to the retail giant's plans concerning the new .amazon domain name. The governments of Bolivia, Brazil, Colombia, Ecuador, Guyana, Peru, Suriname and Venezuela - all members of the Amazon Cooperation Treaty Organization (ACTO) - say that relinquishing the domain exclusively to Amazon could impact on matters of their sovereignty. Diplomats have told the BBC that they are not seeking to deny Amazon use of the domain but are proposing a "shared governance" of it. According to their proposals, Amazon would be immediately allowed to use the domains which are relevant to its commercial interests, such as "books.amazon" or "kindle.amazon". But each country in turn would be entitled to use domains which relate to their cultural heritage - imagine Amazon nations coming together to promote the region under the "tourism.amazon" domain, for example. Crucially, the countries want to establish a committee in which both Amazon and the eight countries would have the opportunity to object to new top-level domains in the future. But Amazon has rejected these proposals, instead suggesting that the .amazon extension be used in conjunction with two letters representing each country - br.amazon for Brazil, for example. The company has declined to comment ahead of the 7 April deadline, but pointed to previous remarks by its vice-president of public policy, Brian Huseman, who vowed that Amazon "will not use the TLDs in a confusing manner". 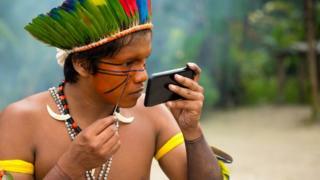 Amazon has promised to work with governments to identify and block the use of "names that touch national sensitivities" and has pledged to support a new top-level domain using local terms such as .amazonia and .amazonas. And last year it tried to persuade the countries by promising them $5m (£3.8m) worth of free Kindle e-readers and hosting services. They turned down the offer. In a letter sent to ICANN in March, the Ecuadorian Ambassador to the US, Francisco Carrión, said: "We are not looking for financial compensation. Nor are we after ex-gratia concessions to use one or a few second-level domains. "It is a matter of sovereignty for many of us, and the offer to share the TLDs with the company Amazon Inc. is already a compromise." The current dispute follows similar cases already settled. In 2013, for example, the US-based outdoor clothing brand Patagonia withdrew an application for the .patagonia extension after objection from Argentina and Chile. A Mexico-based company had to reach a financial agreement with the town of Bar, Montenegro, in order to obtain consent to register the .bar extension. And in 2016, ICANN granted the registry of the .africa gTLD to a charity based in Johannesburg, South Africa, after it received support from three quarters of African Union countries. But the Amazon saga has been quite unlike any other. What's the new weapon against money laundering gangsters? Should Google, Amazon and Facebook fear this woman? How do you know where your olive oil really comes from? Why are Venezuelans seeking refuge in crypto-currencies? Amazon's application was initially deferred, but Brazilian and Peruvian diplomats managed to overturn it by securing the support of the group that represents governments within ICANN - the GAC. That in itself required diplomatic pressure to change the US position from supporting Amazon Inc. to remaining neutral in the dispute. Then Amazon appealed and a review panel ordered ICANN to make a decision by reaching its own conclusions. If the parties don't reach a consensus by 7 April, Amazon will have two weeks to argue its case again before ICANN makes up its mind. The case is prompting questions about the independence of ICANN. Amazon's Brian Huseman told ICANN that "globally, hundreds (if not thousands) of brands have names similar to regions, land formations, mountains, towns, cities, and other geographic places". These could be put off applying for new gTLDs because of "uncertainty" over ICANN policy over geographic names. The US-based body is under pressure to resist the push of governments and some believe it might be more open to arguments coming from the business sector this time around. But Daniel Sepulveda, who served as a US Ambassador, deputy assistant secretary of state, and co-ordinator for communications and information policy from 2013 to 2017, says: "The ICANN community would make a mistake if it diminishes Brazil's concerns or engages in aggressive libertarian rhetoric". He believes ICANN needs to strike a fine balance between the interests and freedoms of businesses, organisations and individuals using the internet, without alienating anyone. "This is a sensitive situation that requires diplomacy, the exercise of mutual respect, and creative mechanisms for ensuring all sides feel fairly treated," he says. So if Amazon and the eight nations don't reach agreement before the deadline, ICANN has a very difficult decision to make - one that might end up pleasing no-one.